Sizzle's Legs: Why does DPS stand behind the boss? Or more likely, why do people like to get the tank killed? Raid bosses (and some instance bosses) hit like a truck. The 3rd boss in Stonecore (rock dude) hits hard on reg, like a hammer on steroids on heroic. So why am I so pissed off about it today? Ran a heroic with my pally who is barely raid geared. I've tanked all the regs, know the fights, and want to get some upgrades to the 150k HP level. I'm at about 133k buffed. 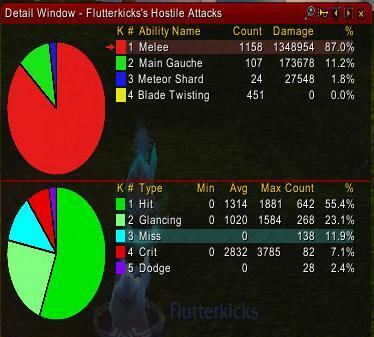 The two melee DPS last night were atrocious. While their DPS was good (12-15k), they stood in front of the boss with me. Had an enhancement shammy and a rogue with us and it was not pretty. One wipe on 2nd boss (dragon) and after 3 on 3rd boss, I posted data from recount showing the insane # of parries by both of them and quit the group. I then, on a whim, took some data from my rogue and warrior, who are also barely geared for heroics. Went to the raid boss target dummy and stood in front and behind to see what kind of numbers I'd get. I had my rogue, Flutterkicks, stand in front of the raid target dummy while I went and took a shower. Came back and it was perfect, about a 1000 hits. 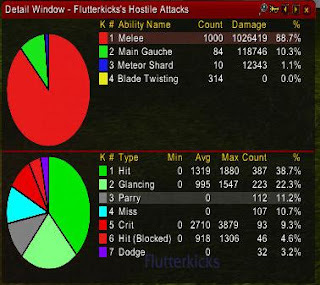 If you notice, I hit only 47% of the time (Hit + Crit). I failed to make contact at all 25% of the time. That's 1 in 4 swings. Great for baseball but this is a raid boss. In addition, the part I am most concerned about is 112 parries. Each time your swing is parried, the mob you are facing's swing timer is reset. If the boss hits for 20k, guess what? You could be hit for several 20k thwaks in a row, provided you have some fail people in your group. I then had Flutter stand behind the raid boss while I went and cooked dinner. Had to do something other than stare at the screen for 10 minutes and wonder when the hell it would be done. This time, the results looked a helluva lot better. My expertise could be higher (14/14) and my hit rating is 15.5%. However, if you notice the hit %, its over 55%. I failed to hit only 14% of the time. Standing behind the boss alone with auto swing would improve my DPS by 100. More to come on this as I want to test my other DPS classes and see how well they could screw up a raid group. BOTTOM LINE? MELEE DPS MUST STAND BEHIND THE RAID BOSS.